The popular Vicar and Moses theme satirized the Church of England and also was represented in published prints and songs from the mid-1700s onward. Simply put, the story refers to a country vicar who was much more interested in spending time at the local tavern than in tending his flock. 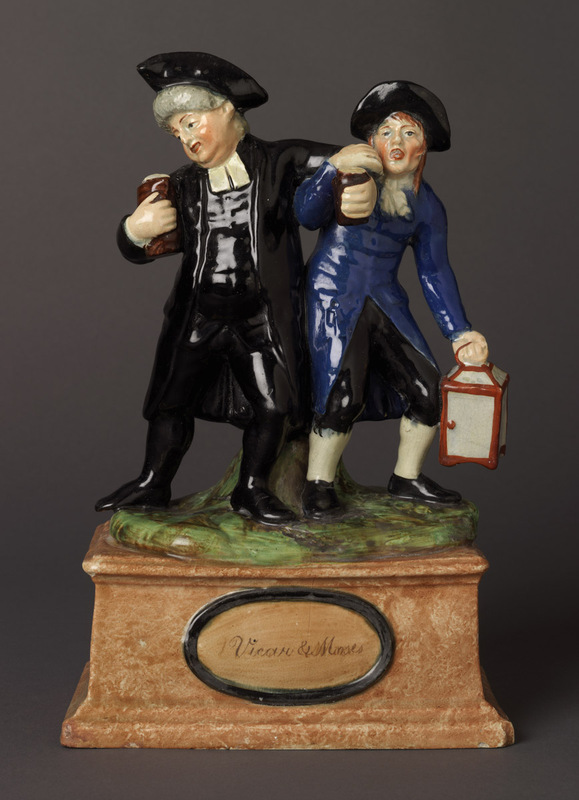 In the portion of the story referred to on the figure group and mug, the vicar’s clerk, Moses, comes to the tavern to lead the drunken vicar off to say prayers at the graveside of a young child. 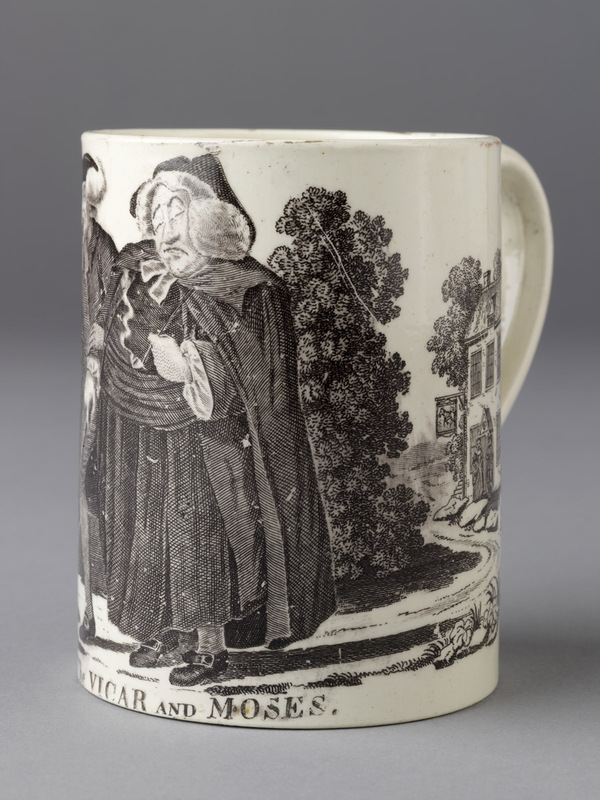 The printed design on the mug most closely resembles a print published in England by Bowles and Carver in 1785, but variations also were available from Thomas Colley (published by Hannah Humphrey, 1782) and Thomas Rowlandson (1784), among others. Some of the prints feature verses from a poem about the Vicar and Moses with varied wordings ultimately thought to be based on lyrics by G. A. Stevens, Esq. Alternatively, one might have read the poem in widely published in works such as The London Magazine or Gentleman’s Monthly Intelligencer (London, 1771) or George Alexander Stevens’ Songs, Comic, and Satyrical (Oxford, 1782). And I’ll walk with my Lanthorn before ye. A corpse, Moses, can’t run away. I hate to be call’d from my liquor. Such a subject should be but a Vicar. Join us and learn more about English and other ceramics at Winterthur’s upcoming Ceramics Up Close symposium, April 14–15, 2016. For more these and other Vicar and Moses-themed ceramics at Winterthur, visit our online museum database. This entry was posted in Academic Programs, antiques, Ceramics, Decorative Arts, Events, museum collection, Uncategorized and tagged 19th century, ceramics, ceramics conference, decorative arts, Winterthur Garden, Winterthur Museum, Winterthur Museum Garden & Library. Bookmark the permalink.